The China-Russia Joint Research Center on Space Weather was established in December, 2000 by the Institute of Solar-Terrestrial Physics SB RAS (ISTP SB RAS ) and the National Space Science Center (NSSC), under Chinese Academy of Sciences, previously known as CSSAR. 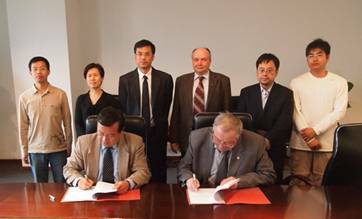 The agreement on scientific cooperation between the Chinese Academy of Sciences and the Russian Academy of Sciences' Siberian Branch signed on October 13, 1999, and the agreement for joint studies on solar-terrestrial physics and its applications signed by CSSAR CAS and ISTP SB RAS on November 2, 2000 served as the basis for creating the joint center. On April 26, 2012, Professor Alaxandr Potekhin, Director of Institute of Solar-Terrestrial Physics, Siberian Branch, Russian Academy of Sciences (ISTP, SB, RAS), and Professor Alaxandr Potapov, Deputy Director of ISTP, SB, RAS visited National Space Science Center, Chinese Academy of Sciences and were received by Professor WU Ji, Director General of NSSC and Professor WANG Chi, Deputy Director of NSSC. The two parties renewed the Charter of the Joint Research Center on Space Weather, extending it for the next five years, and, taking Academician Geliy A. Zherebtsov's proposal into account, appointed Prof. Aleksander P. Potekhin and Prof. WU Ji as Co-Directors of the Russia-China Joint Research Center on Space Weather. The two parties signed Agreement for Joint Research in Solar-Terrestrial Physics, ushering the dawn for the next five-year cooperation. The first Co-director of the Center from Russian Academy of Sciences is Prof. Zherebtsov Geliy Alexandrovich, Academician of RAS, who won the 2012 Award for International Scientific Cooperation of CAS. Working Together Towards A Better Space Science---An Interview with Prof. G.A. Zherebtsov and Prof. WU Ji. Solar activities related to solar storms. Propagation of solar storms through the solar corona and interplanetary space. Dynamic processes at different spatial and temporal scales which are associated with geospace storms and substorms. Propagation of disturbances from high to middle and low latitudes of the Earth's ionosphere and atmosphere. Feedbacks and coupling between geospace and the atmosphere in a global context. Global space weather system and its response to external impacts. Diagnostics of the geospace, and forecasting principles and modeling. 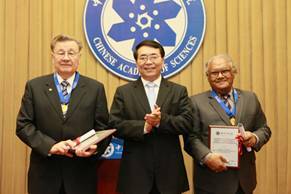 The principal objective of the center is to organize and promote successful cooperation between Chinese Academy of Science and Russian Academy of Sciences on space weather research through two leading institutes NSSC, CAS and ISTP, RAS, and extend to other related institutes of the two academies. to develop techniques for diagnostics of geospace and space weather forecasting methods. According to the new Agreement signed in 2012, regular bilateral scientific workshops organized by NSSC and ISTP shall be held no more rarely than once per two years. As of 2012, eleven bilateral workshops have been held. The XI Russian-Chinese Workshop on Space Weather held at ISTP was held at ISPT SB RAS from 3 to 8 September 2012. The institutes involved from China include National Space Science Center, National Astronomical Observatories, Wuhan Institute of Physics and Mathematics, and Institute of Geology and Geophysics, CAS. The Workshop was organized within the following scientific sessions: Geoeffective processes on the Sun and in interplanetary space; The effect of the solar phenomena on magnetospheric processes; Processes in the ionosphere and upper atmosphere, stimulated by solar and magnetic disturbances. The 1st Russian-Chinese Workshop on solar-terrestrial physics and its applications (space weather), Irkutsk, 14-19 December 2000. 16 researchers from China took part in the workshop. The 2nd Chinese-Russian Workshop on Space Weather, Beijing, 14-15 September 2001. 14 researchers from ISTP SB RAS submitted reports on obtained results in the frame of joint projects. The 3rd Russian-Chinese Workshop on Space Weather, Irkutsk, 19-21 June 2002. 32 researchers from China took part in the workshop. Session of the 4th Chinese-Russian Workshop on Space Weather was held as special Section of 10th Conference on space physics of Chinese society of space research, 18 - 19 October 2003, Shanghai. 10 researchers from ISTP SB RAS took part in the workshop. The 5th Russian-Chinese Workshop on Space Weather, Irkutsk, 14-17 October, 2004. The Institute received 21 researchers from China. 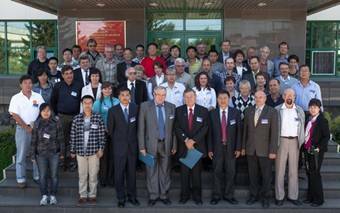 The 7th Russian-Chinese Workshop on Space Weather was held in Irkutsk, 11-17 September 2006. 15 researchers from China and 48 presentations. The 8th Chinese-Russian Workshop on Space Weather was held in Beijing, 23-25 September 2007. 18 researchers from ISTP and 57 scientific presentations. The 9th Russian-Chinese Workshop on Space Weather was held in Irkutsk, 22-27 June 2009. 74 presentations. The 10th Chinese-Russian Workshop on Space Weather was held in Beijing, November 1-2, 2010. The 11th Russian-Chinese Workshop on Space Weather was held in Irkutsk, September 3-8, 2012.